SICILY COUNTRYSIDE: Sicily is one of my most favourite parts of Italy. The people are very friendly. Its ruggedly beautiful landscapes are breathtaking. This photo was taken not long before a much-needed summer downpour of rain. There are few places in the world that have been influenced and shaped by so many different cultures. The rich history of Sicily has been formed by Phoenicians, Greeks, Romans, Byzantines, Arabs, Normans, Austrians, French, Germans, Spanish, Italians and the British. TUSCAN FARM BUILDING, ITALY: I love shooting photos in Tuscany. This photo was taken in early July, late in the sunflower growing season. The Tuscan region is where the Italian Renaissance was born– home to Michelangelo, da Vinci, Botticelli and Puccini. And, of course, it’s also the home of Chianti wine. BLUE CHAIRS, GREEN GRASS, SOYBEAN FIELD: This shot was taken in southern Ontario on the northern boundary of Durham Region. The field crop behind the chairs is soybeans– a large cash crop in the Province of Ontario where approximately 2 million acres are planted annually. The crop is increasingly grown elsewhere in Canada and enjoys a good export market. For exported beans, the biggest buyer (2006 data) is Japan, followed by Malaysia, the Netherlands and Iran. The beans have many uses. They are grown for specialty foods, oil production and livestock feed. Ever eat those artificial bacon bits? Yummy? Chances are they were made from soybeans. They have industrial uses as well. Henry Ford, founder of the Ford Motor Company, was an advocate for the use of soy for plastics, paints and fibres. Printing inks are often made from soy and it’s even used as an eco-friendly lubricant and in candles and crayons. Soybeans are also good in biodiesel. Makes me want to sit in one of those blue chairs and dream up another use for this magic bean! 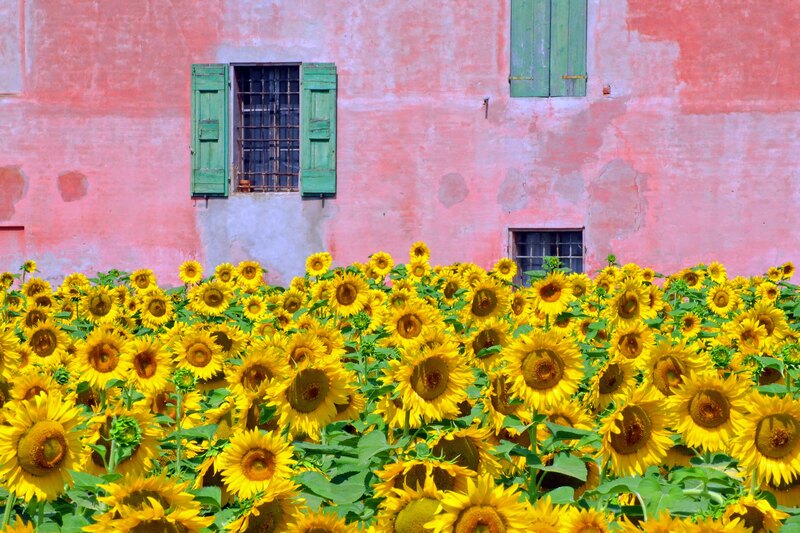 SUNFLOWER FIELD, TUSCANY, ITALY: This region of Italy is spectacular near the end of the day. The golden light from the setting sun played beautifully on this field of sunflowers. Shot handheld with a Nikon D300, with a Nikkor AFS 70-300mm lens at 187mm, f25, 1/250th sec., ISO 1250. Photo by John Ecker | pantheon photography.